After posting my 2012 Sonderbooks Stand-outs, I couldn’t help but notice that some names have come up again and again. So I’m doing a series of blog posts about those authors who have appeared on my Stand-outs lists before. And next up is Mo Willems, with a total of 8 Sonderbooks Stand-outs since 2003. I discovered Mo with that wonderful classic, Don’t Let the Pigeon Drive the Bus It of course was a 2003 Sonderbooks Stand-out, my top choice for Picture Books. Unfortunately, my kids were too old to appreciate the full power of the pigeon books, but I remember in 2006 when I stayed for a month and a half with my friend, I got to pull them out and read them to her kids. They especially liked it when I read the temper tantrum page. 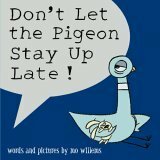 Another Pigeon book, Don’t Let the Pigeon Stay Up Late, made the 2006 Sonderbooks Stand-outs list, once again #1 for Picture Books. In 2008, I met Elephant and Piggie, and fell in love. This time, Mo had not one but three 2008 Sonderbooks Stand-outs. Are You Ready to Play Outside? was #5 in Picture Books, The Pigeon Wants a Puppy! was #6, and I Will Surprise My Friend! was #7. And I still like the essay I wrote about Are You Ready to Play Outside? and contentment (and, well, my ex-husband). My 2009 Sonderbooks Stand-outs featured another Elephant and Piggie book at #3 in Picture Books, Pigs Make Me Sneeze! How I wish I’d had it back in the day when I taught Intro to Statistics! A picture book lesson that Correlation does not imply Causation! Yes! 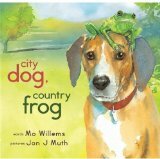 My 2010 Sonderbooks Stand-outs had something new, a book written, but not illustrated, by Mo Willems, City Dog, Country Frog, which was #4 in Picture Books. And finally, this year the Pigeon was back! 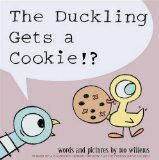 In my 2012 Sonderbooks Stand-outs, The Duckling Gets a Cookie!? delightfully played with the themes from all the previous Pigeon books and hit #2 in my Picture Books list. Now, I may not have permanent MO graffiti on my blog like Mother Reader, but I’m definitely a huge fan. I think the man’s a genius, and I’ve found that if I want kids to enjoy a storytime, all I have to do is include a Mo Willems book. May he continue to be prolific! I have a feeling he’s going to feature on many lists to come. When I first read Green, I thought it was good, but didn’t give it a lot of attention. It grew on me. The exquisite craftsmanship with so many details in exactly the right place deserved another look. We’ve got forest green, sea green, lime green, pea green, jungle green, khaki green, fern green, wacky green, and more. But there are imaginative, beautiful, and detailed paintings on each page, not the way you’d necessarily think those adverbs would go. And each page also has a die cut hole. The hole works in very different ways on both sides of the page, enhancing the picture both times. This isn’t as much a book for sharing with a large group (though it would work that way) as it is for exploring one-on-one with a child. They will want to look at the pictures and at the way the die cuts work again and again. This book is a masterpiece of craftsmanship and a beautiful work of art. I’m so glad it won Caldecott Honor. This is one that’s hard to describe with words. You need to check it out and look at it yourself. Then take another look. Better yet, let a child show you how fascinating it is. I’ve been posting features about authors with 2012 Sonderbooks Stand-outs who had Stand-outs in previous years. I’ve already covered Shannon Hale and Sherwood Smith, so next up is Jasper Fforde, with a total of 9 Sonderbooks Stand-outs. I discovered Jasper Fforde in 2004, thanks to the recommendation of my friend Shannon. The first two books in the Thursday Next series were both 2004 Sonderbooks Stand-outs in Science Fiction and Fantasy, The Eyre Affair at #2, and Lost in a Good Book at #5. I kept reading, and the next two Thursday Next books were 2005 Sonderbooks Stand-outs. The third book, The Well of Lost Plots, was #4 in Science Fiction. The fourth book, Something Rotten, was #1 in Science Fiction. And then he started writing the Nursery Crime series. The Big Over Easy, solving the mystery of who pushed Humpty Dumpty, was also a 2005 Sonderbooks Stand-out, #7 in Mystery. His next Nursery Crime book, The Fourth Bear was a 2006 Sonderbooks Stand-out, #5 in Mystery Fiction. Have I used the words “quirky” or “bizarre” yet in talking about Jasper Fforde? In this one, it appears there are not merely three bears. It was back to the Thursday Next series in 2007, in fact with the book Thursday Next a 2007 Sonderbooks Stand-out. But that was the year I didn’t get all the Stand-outs reviewed, since I was dealing with little things like finding a job after my marriage fell apart and moving to the other side of the world and getting my Master’s in Library Science. But, yes, it was another wonderful addition to the series and was #5 in Fantasy Fiction. 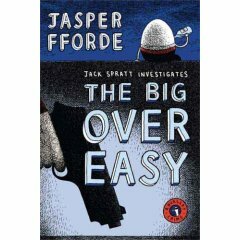 In 2010, Jasper Fforde started another quirky and bizarre new series, which was a 2010 Sonderbooks Stand-out. The whole society is based on what colors people can see. (How does he come up with these ideas, anyway?) Shades of Grey: The Road to High Saffron was #7 in Fiction for adults. And finally in 2012, he wrote a fantasy novel for teens, The Last Dragonslayer, which was a 2012 Sonderbooks Stand-out, #10 in Teen Fiction. There you have it, 9 Sonderbooks Stand-outs, and I’ve only been reading his books since 2004. I highly recommend his books for any time you’re in the mood for clever, quirky, and bizarre. More bizarre than pretty much any other author you’d ever care to read. In a good way. Dial Books for Young Readers, 2012. 312 pages. I didn’t read Three Times Lucky until 2013 had started, so it didn’t have a chance to be on my 2012 Sonderbooks Stand-outs. I did read it in time for our library’s first Mock Newbery voting, and Three Times Lucky was our winner. It hadn’t gotten a lot of attention on the Heavy Medal blog, so I was thinking of it as kind of a longshot and was very happy when it achieved Newbery Honor. Three Times Lucky has so much to like about it: Quirky characters in a Southern small town. A girl without parents who doesn’t know who they are (she was found in a hurricane). Good friends who get into scrapes and adventures. A hurricane and deadly peril. And, oh yes, a murder mystery. With meddlesome kids. Yes, there are some coincidences. A few details of the plot are maybe a tiny bit of a stretch. But most of all, the book is fun reading. The townsfolk of Tupelo Landing, with all their quirks, come to life and seem real. And besides having a mystery to solve, there are budding romances, Dale’s brother in a big race, and Mo’s sending bottles upriver hoping to find her mother. This book is a heap of fun, and I’m so glad it’s joining the Newbery canon. The thoughts in this book seem to be mainly geared toward people in 12-step programs, but even if you aren’t in one (as I am not), the wise words are a great way to start your day. The daily pages are short. Each day’s meditation begins with a quotation from a woman and ends with a summing up thought for the day. The past that we hang onto stands in our way. Many of us needlessly spend much of our lives fighting a poor self-image. But we can overcome that. We can choose to believe we are capable and competent. We can be spontaneous, and our vision of all that life can offer will change — will excite us, will cultivate our confidence. Source: This review is based on my own personal copy. Today I watched the complete webcast of ALA’s Youth Media Awards, and I was very happy. For the first time since the 2010 awards, both the Caldecott winner and the Newbery winner were Sonderbooks Stand-outs. And the winner of our library’s fledgling Mock Newbery Book Club vote got a Newbery Honor! Although there were a lot of books I loved that didn’t appear, I am completely happy with the ones that did. Let me go through the lists, giving my reaction. First, let me also say that I’m way behind in posting reviews. Tonight I blitzed through a stack and wrote 7 reviews, but now I have 69 reviews I’ve written that I still need to post. That’s down from 99 such reviews in December, but it’s still a daunting task, and I confess I’m letting a lot more books I read go unreviewed. So my plan is to finish posting all the reviews of Sonderbooks Stand-outs tomorrow or the next day. Then I’ll tackle some of these award winners that I’ve already reviewed but not posted. Let me go through the major awards, in the order they were announced. You can find all the award winners listed at ala.org. Please, if you’re reading this, I’d love to hear your own reactions. Which of the books have you read? Any big disappointments? Special thrills? I haven’t read any of the Alex Awards, so I won’t go through those. Some I’d meant to read, so they make my To Be Read list longer. I haven’t read any of the Schneider Family winners, though A Dog Called Homeless, by Sarah Lean, was chosen to be a Summer Reading Program selection for our library system. Some people expressed surprise and disappointment that Wonder didn’t receive a Schneider Family Award. But I don’t think it was actually eligible. The Schneider Family Award is given “for books that embody an artistic expression of the disability experience,” and Auggie in Wonder mentions many times that he actually doesn’t have any disability — just a deformed face. I’ve read one of the Stonewall Honor books, Drama, by Raina Telgemeier. I’ll post my review soon. I’m kicking myself about the Stonewall Award Winner, Aristotle and Dante Discover the Secrets of the Universe, by Benjamin Alire Saenz. Because at an ALA conference I’d accidentally picked up not one, but two Advance Review Copies. But I didn’t get around to reading it before it was published, and I’ve given both copies away. Oh well! For the Coretta Scott King Awards, I was happy about the Illustrator Honor for I Have a Dream, illustrated by Kadir Nelson. I’ll post my review of that soon. I’ve also read the Illustrator Winner, I, Too, Am America, illustrated by Brian Collier, which is a Capitol Choices selection, and I think it’s a wonderful choice. I’ve read the CSK Author Honor books, but not the winner. I’ll post the review soon of No Crystal Stair, by Vaunda Micheaux Nelson. I wasn’t a fan of its Newbery chances, but I do think it’s an outstanding book, and am happy it got some honor today. The Margaret Edwards Award winner for her body of work is Tamora Pierce. I read the Song of the Lioness quartet before I started reviewing books, and I’m happy about this choice. I will definitely plan to attend the Margaret Edwards Luncheon again this year. For the Morris Award, the only one of the Finalists I’ve read, Seraphina, by Rachel Hartman, was the winner, and I’m very happy about that. I got a kick out of the Odyssey Honor for the audiobookGhost Knight, by Cornelia Funke. This was a book under consideration for the Cybils shortlist by my committee, and I was the only one who listened to it instead of reading it. I was a much bigger fan of the book than anyone else, and I think I was probably swayed by the wonderful audio recording. I was also happy about the Odyssey Award Winner, The Fault in Our Stars, by John Green. Though I haven’t listened to the audio version, I loved the book, and the audiobook is a Capitol Choices selection this year. Then came the Printz. Aristotle and Dante Discover the Secrets of the Universe was an Honor book, so I again kicked myself for not having read it. My favorite book of the year, Code Name Verity, by Elizabeth Wein, did get a Printz Honor. And though I can’t fathom another book being better than it, I haven’t actually read the Printz winner or any of the other Printz Honors, so I have to reserve my righteous indignation and be happy that it did receive Honor. I haven’t read any of the Pura Belpre honor books, but again Aristotle and Dante Discover the Secrets of the Universe was the big winner, so I received more kicks from myself. The Arbuthnot lecture will be given by Andrea Davis Pinkney. Wouldn’t that be fun to attend! I haven’t read any of the Batchelder winners. The Sibert Medal almost completely overlapped with the ENYA Award. The Honor books were Electric Ben, by Robert Byrd (which I haven’t read completely but is a Summer Reading Program selection for our library system); Moonbird, by Phillip Hoose; and Titanic: Voices from the Disaster, by Deborah Hopkinson. The winner was (again) Bomb, by Steve Sheinkin. The Wilder Medal for lifetime achievement was given to Katherine Paterson. Wonderful choice! The Geisel Awards had my biggest disappointment. I wanted to see Penny and Her Song or Penny and Her Doll, by Kevin Henkes represented, and was sad that they weren’t. However, I was particularly happy with two of the Honor books, Let’s Go For a Drive! by Mo Willems (I always love his books), and Pete the Cat and His Four Groovy Buttons, by Eric Litwin, which was a 2012 Sonderbooks Stand-out. And then came the biggies, the longest-established awards. For the Caldecott, I’ve read and appreciated Extra Yarn illustrated by Jon Klassen, written by Mac Barnett (despite the upside-down knitting needles), Creepy Carrots, illustrated by Peter Brown, written by Aaron Reynolds; One Cool Friend, illustrated by David Small, written by Toni Buzzeo, and Sleep Like a Tiger, illustrated by Pamela Zagarenski, written by Mary Logue. 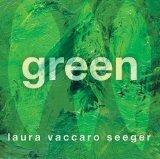 I count myself a fan of Green, by Laura Vaccaro Seeger, and that review will be forthcoming. But the winner, This Is Not My Hat, by Jon Klassen, was a Sonderbooks Stand-out and one of my favorite picture books of the year. Almost everyone at my library has read it already, because I pushed it on them. And finally, my happiness overflowed with the Newbery announcements. I thought Splendors & Glooms had some flaws, but had to admit that the writing was outstanding, so I think it’s Honor was well-deserved. Bomb made its third appearance of the day, so I’m glad I’m currently reading it. But I was especially happy about the third Honor book, Three Times Lucky, because that was the selection of our library’s Mock Newbery Book Club. I had thought we’d picked a longshot, so I was so happy to see it up there. I wrote its review today, and will post it soon. And the Newbery Medal winner? The wonderful The One and Only Ivan, by Katherine Applegate. When I first read The One and Only Ivan, I hoped it would win the Newbery. Since reading it, it got edged out in my hopes by Summer of the Gypsy Moths and Palace of Stone, but discussion on Heavy Medal and in Capitol Choices convinced me that those books probably weren’t serious contenders, so my hopes were riding on The One and Only Ivan again. So happy that those hopes were realized! How about you? Which choices made you happiest? Which omissions made you saddest? Which books are hitting the top of your TBR piles? I’d love to keep discussing…. Farrar, Straus, and Giroux, 2012. 160 pages. Moonbird tells the story of a rufa red knot banded with the number B95 in the year 1995 who has been spotted many times since. These birds are some of the greatest distance travelers on earth, and B95 is the oldest known such bird. This book goes into detail about what physiological changes and athletic feats go into B95’s journey. The author makes the life of a little shorebird into an epic tale. He interviewed many scientists all interested in helping the red knots and other shorebirds continue to survive. Spinning their stories into the overall narrative keeps the book fascinating. This book covers science, nature, the environment, and what you can do to help. An outstanding science book that will interest everyone from elementary school readers to adults. I doubt anyone can read this book without learning something, but probably a lot of somethings. And even harder would be to read this book without becoming interested in the plight of a little bird and its flock. Tyndale House Publishers, 2012. 280 pages. This powerful story had me transfixed until I finished it. Christi Paul tells about her four years of marriage to a man who abused her emotionally and the repercussions of that in her life. She deeply wanted to stay. She’d made a vow. She tried hard to be able to take it. But ultimately, her faith in God helped her see that she needed to leave and helped her recover. This book is good on many levels. In the first place, it’s a mesmerizing story. Christi Paul tells about how she fell in love with Justin and decided to marry him. Looking back, she can see she made a bad decision, but reading the book, it’s easy to understand how it happened, and why it was hard for her to leave. Second, this book provides a window into emotional abuse. It can help people understand how women get into a hurtful situation, and why it’s so hard to get out. It can help you see one form emotional abuse takes and give you compassion for women in that situation. Christi Paul doesn’t write to make you feel sorry for her, but she does help you understand her. She also tells the hard questions she asked herself that helped her to heal. Third, this book is all the more compelling for women who’ve been in some kind of abusive relationship. I appreciated that she took her vows before God seriously, and was in no hurry to divorce. I think the parts that most resonated probably say a lot about the reader. (Perhaps I still need to work through feeling guilty about my own divorce?) It’s so easy to see in someone else’s life that it does not glorify God to live in such a hurtful relationship. Now, Christi’s ex-husband was more overtly abusive than many. And she also was able to see that she’d made a mistake marrying him in the first place. It’s perhaps harder when the emotional abuse is more covert than name-calling, taking forms like blaming or defining your reality. In those cases, it’s all the harder to see clearly that this is emotional abuse and this is wrong. So I still strongly recommend Dr. Patricia Evans’ books on verbal abuse, because they are so crucial to understanding the many different forms abuse can take. It’s also perhaps harder when the abuse starts in a mid-life crisis situation, rather than at the start of the marriage. You can’t tell yourself that you simply shouldn’t have married him. But that still doesn’t mean it glorifies God to stay in that situation. People often think holding on is what makes you strong, but sometimes it’s letting go. I was committed to releasing all that haunted me from this relationship. I wanted to learn from it, yes, but I was no longer willing to be chained to the memories that made me feel inadequate, insecure, and fearful. Each of us has a different story. Not everyone needs to leave her partner. We don’t want to abandon people who need help. Your answer might not be to get out — only you know what’s right in your situation. And my purpose isn’t to demonize people who are abusive. They’re wounded and hurting in their own way. But please hear this: until someone is healthy enough to treat you with civility, dignity, and respect, that person isn’t healthy enough to be in your life. The part on healing during and after abuse is especially powerful. I strongly believe that one part of healing is coming to a place of forgiveness, and that is much much easier when you can begin to see the many ways good has come into your life through the abuse. Not that abuse is good, but that as you come through it, you grow. Christi Paul shows much of her process of thinking this through, and it’s helpful and healing and thought-provoking. I loved the way she showed that living through the abuse helped her become a stronger person in many, many different ways. I feel the same way. I like the person I am after coming through the end of my marriage, and it resonated to see Christi Paul write the same thing. Hear this loud and clear, my friends: you weren’t put here to be abused. God’s will isn’t for us to wake up each day mired in fear, self-doubt, and condemnation. He wants us to see ourselves the way he sees us — wounded but worthy. To view ourselves and each other with forgiveness and grace. To trust and believe in Him despite where we’ve been, what we’ve done, or what someone told us we are. This book is a beautiful story of hope and God’s grace, and it gives the reader plenty to think about. I know I’ll be thinking about Christi Paul’s words for a long time to come. You are currently browsing the Sonderbooks blog archives for January, 2013.